Visitors of Ethnographic Museum will have opportunity to learn more about 19th century Megrelian "Sajalabo House", during demonstration of traditional lifestyle performance. Georgian National Museum Giorgi Chitaia Open Air Museum of Ethnography invites you on the presentation of revived Kakhetian House on November 9, 2013 at 2 p.m.
Open Air Museum of Ethnography presents photo exhibition "Multicultural Georgia". Exhibition will be held On May 21, 2011 at 14:00. Museum extends on 52 hectares and includes 14 traditional architectural exponents from different regions of Georgia. On July 3, at 8 pm, we invite you to the presentation of the "Book Space" in Open Air Museum of Ethnography. To make your wedding ceremony special and unforgettable – Georgian National Museum offers a wedding ritual at the Open Air Museum of Ethnography with the live reconstruction of the Georgian national traditions. On July 2, at 7 pm, Georgian National Museum Open Air Museum of Ethnography invites you at the Natural Wine and Food Festival. At the festival you will meet winemakers, viticulturists and restaurateurs who will host you with natural food and homemade wine. The festival is dedicated to the memory of young Georgian winemaker Vakho Paghava. On May 20, 2017, from 10:30 am, in the frames of Georgian National Museum museum week dedicated to the international Museum Day, Giorgi Chitaia Open Air Museum of Ethnography hosts educational activities. Georgian National Museum Open Air Museum of Ethnography presents courses of the traditional craft. Program will take place every weekend from 1pm to 5pm starting from September 12 and will last until November 22, 2015. The project takes place within the framework of the program supporting and promoting the Georgian traditional crafts and folk art. Georgian National Museum Giorgi Chitaia Open Air Museum of Ethnography invites you at the presentation of the revived ethnographic house of Ontopho. Presentation will take place on September 28 at 2 p.m.
Georgian National Museum Open Air Museum of Ethnography presents courses of the traditional craft. Program will take place every weekend from 1pm to 5pm starting from April 5th and will last until June 29, 2014. The project takes place within the framework of the program supporting and promoting the Georgian traditional crafts and folk art. Georgian National Museum Giorgi Chitaia Open Air Museum of Ethnography presents final workshop of craft making program and exhibition of crafts made during the last three months of program. Event will be held on November 24, 2013 at 1 p.m.
Georgian National Museum Giorgi Chitaia Open Air Museum of Ethnography invites you at revived Kakhetian House from November 10, 2013. Georgian National Museum Open Air Museum of Ethnography organizes presentation of Georgian folk craft making program and 19thcentury Megrelian house (Sajalabo). Event will be held in the frames of Georgian Folk Craft program, on September 15, 2013 at 2 p.m. Visitors of Ethnographic Museum whave opportunity to learn more about 19th century Megrelian "Sajalabo House", during demonstration of traditional lifestyle performance. The Georgian National Museum and Chitaia Open Air Museum of Ethnography presents courses of the traditional craft every weekend from 1pm to 5pm starting from August 24, 2013. The project takes place within the framework of supporting and promoting the Georgian traditional craft and folk art. On 5th of June 2013, from 11:00 till 17:00 Georgian National Museum, G. Chitaia Open Air Museum of Ethnography presents different events dedicated to the World Environment Day. October, Open Air Museum of Ethnography celebrates its 40 years anniversary. On the first day of celebration, there will be held opening session and on the second day Ethnographic Museum will host different festival events. Free to: ICOM members, "Culture Card" owners, museum employees, people with limited abilities, internally displaced persons (IDPs), socially unprotected persons. Note: visitors receiving special benefits or free admission privileges should present relevant documents. Handbags (maximum size A3) can be brought into the museum. In case of questionable items , a decision will be made by authorized personnel. In case of violating the aforementioned policy, the Georgian National Museum is not responsible for the loss or damage of any items. Visitors should collect their belongings by the end of the working day. After the museum closes all the items left behind are considered lost. In case of loss of checked items, authorized personnel should be notified immediately. 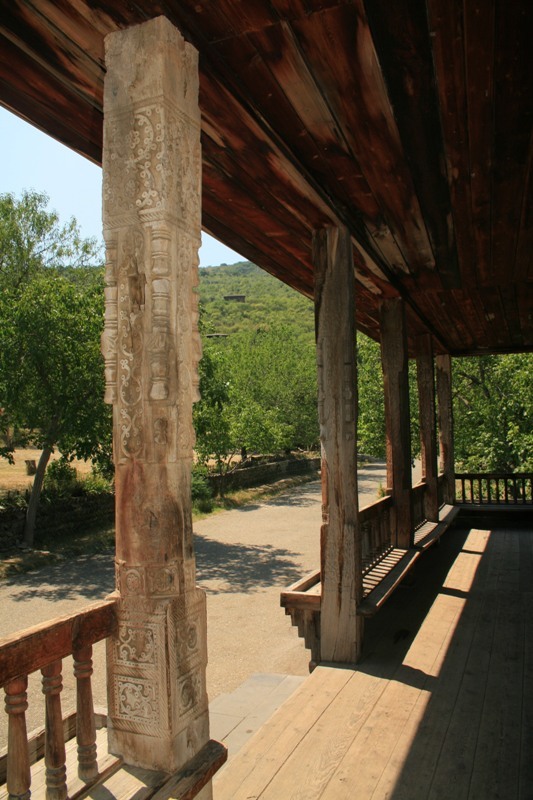 The Open Air Museum was founded on April 27, 1966 by the famous Georgian ethnographer Giorgi Chitaia. It is located in Tbilisi's Vake district, to the west of "Turtle Lake". It occupies 52 hectares of land and houses more than eight thousand artifacts brought from all over Georgia. The Open Air Museum encompasses 14 ethnographic zones: Kartli, Samegrelo, Adjara, Abkhazia, Svaneti, Khevsureti, Kakheti, Meskheti, Javakheti, Guria, Imereti, Racha, Lechkhumi and Ossetia. Each exhibit presents a certain historic-ethnographic area of Georgia. Together with architectural monuments, the museum presents ethnographic materials - different kinds of tools, textiles, and ceramics. The museum also includes the 5th-6th century basilica of Sioni, as well as a rich collection of grave stones in relief. Visitors can explore on their own, or enjoy guided tours around the museum. The museum provides a tranquil environment for visitors to experience Georgian folk exhibitions and festivals throughout the year, and has a quaint Georgian restaurant where you can enjoy the breathtaking view of Tbilisi.